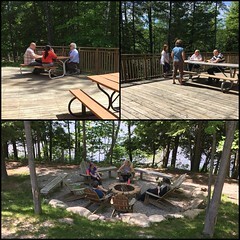 It was an absolute pleasure to work with the members of the Educational Technology Organization of Michigan at their Summer 2017 retreat. I sincerely thank Carl Weckerle and the ETOM board for the invitation! ETOM has a fantastic retreat model set up at the Kettunen Center. You arrive at lunch on Thursday, we had a workshop from 1-5, then had dinner and relaxed by the lake. The next morning we had breakfast – a few rounds of sessions/discussions and then lunch before departure. The ETOM board gave me the challenge of tackling the wicked problem of “Adequate Assessment of eLearning Classes.” This has been on the list of greatest challenges for distance education program administrators for the past several years on the ITC Distance Learning survey. It was no small feat – but – our iterative journey helped us explore the issue from several stakeholder standpoints. You can see the prompts & activities in the slide deck below. One outcome of of our collective sharing was a brief collectively authored Landscape Scan which has several links to assessment initiatives and supports in the ETOM network. On Friday, I had the opportunity to share some of the theories and tools we use at the MSU Hub to take on some of our “wicked problems” at MSU (slides below.) I look forward to continued conversations with the ETOM community! The goals of the workshop are two-fold. First, participants will engage in an embodied experience using design thinking. This will give participants first-hand and participatory knowledge of design thinking techniques and processes. Second, participants will be using these design thinking methods to address a “wicked problem” identified by ETOM, which will produce solutions (and questions) for the ETOM retreat. Our presenter is Dr. Leigh Graves Wolf. Leigh Graves Wolf is a teacher-scholar and her work centers around online education, emerging technologies and relationships mediated by and with technology. She has worked across the educational spectrum from K12 to Higher to further and lifelong. She has been a disc jockey, network administrator, teacher, instructional technologist and now professor. She believes passionately in collaboration and community and is currently the Assistant Director of the MSU Hub for Innovation in Learning & Technology, and academic specialist in the Dean’s office in the MSU College of Education, and a fixed-term Associate professor of Educational Technology at Michigan State University. In January 2016 Michigan State University started a new campus initiative: The Hub for Innovation in Teaching & Learning (“The Hub”). The Hub’s mission is to “facilitate the passion and inventiveness of students, faculty, staff, and stakeholders both inside and outside of MSU to create, identify, and accelerate new ways to collaborate, learn, research, and deliver instruction.” While the core staff of The Hub leadership team has anchored much of its work and processes around design theories and processes. In this session Leigh will share examples of their workflow processes and the digital (and analogue) tools used in their work.